State lawmakers are officially at the one-quarter point of this year’s legislative session after wrapping up four weeks’ worth of work. So far only one bill – the Real ID compliance act – has made it through the Legislature and been signed into law by Gov. Mary Fallin. And there remains plenty to do to find a solution to the state’s $878 million budget gap and tackle the hundreds of bills that remain at alive this point. Here are five takeaways from what the Legislature has accomplished so far and what is on the horizon for coming weeks and months. Lawmakers and the governor’s office have made little progress so far in finding agreements to deal with the budget shortfall. Don’t expect to see it change anytime soon. Legislative leaders said ongoing budget talks will heat up in the coming weeks. But they said it will take time to find a consensus. House Speaker Charles McCall, R-Atoka, said members of his caucus have told him they don’t even want to start looking at tax increases, such as the cigarette tax hike, increasing oil and gas taxes, and the governor’s plan to increase the fuel tax and expand the sales tax base, until after state expenses are thoroughly examined. It is increasingly looking like state agencies, which last month were ordered to cut millions from their current budgets due to the state’s revenue shortfall, could see further reductions. 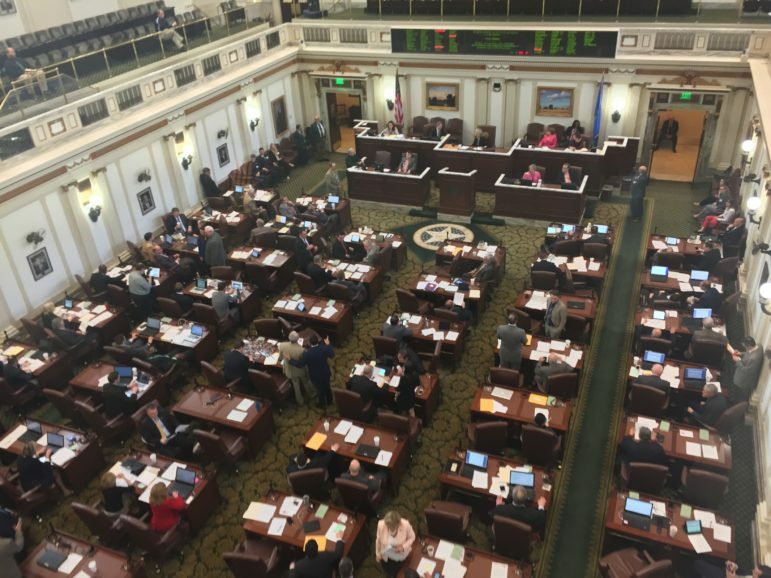 Senate Pro Tempore Mike Schulz, R-Altus, said many Republicans believe there are “efficiencies” still to be found in the budget, and cutting spending is going to be part of the plan to bridge the budget gap. Depending on the size of cuts GOP leaders propose, this idea could face strong opposition from Democrats and the governor’s office. Fallin said she would consider vetoing a budget bill that includes too many cuts to core state services, such as education, public safety and health. Lawmakers are also divided on the likelihood teachers will see a pay raise for the next school year. House lawmakers are more optimistic. McCall said it’s still his goal to pass the bill, sponsored by Rep. Michael Rogers, R-Tulsa, that provides teachers a $1,000 pay boost this year and an additional $5,000 over the next two years. And although GOP lawmakers have yet to say where they will find the money – a point of contention that has troubled many Democrats – Majority Leader Jon Echols went so far as to say Thursday he is “very confident” teachers will get a raise for the 2017-18 school year. Thursday was the cutoff date for legislation to get out of committee in their chambers of origin or be tabled until next year. That deadline whittled the original 2,280 bills or resolutions down to 873 surviving proposals. An analysis of those bills and resolutions shows most are Republican-led efforts. That’s no surprise given that the GOP controls about 78 percent of the state’s legislative seats. But the percentage of surviving proposals with a Republican lead sponsor was even higher than that. A total of 786, or 90 percent, of these bills or resolutions were sponsored by a member from the majority party. Both Republican- and Democratic-led proposals will be whittled down further in the coming weeks. They must be successfully voted out by their full houses of origin by March 23 to stay alive. Senate Bill 560: creating state-funded education savings accounts allowing students to attend private schools. Senate Joint Resolution 30: adding a constitutional provision essentially eliminating civil asset forfeiture. SB 37: requiring five-day school weeks (this failed in committee, so it can’t be brought up next year). House Bill 1530: Making it illegal for an employer to fire someone because the employee asked, discussed or disclosed wages of another employee. SB 805: Accepting the optional Medicaid expansion. HJR 1003: Removing the constitutional provision that requires revenue-raising bills to secure three-fourths majority votes from both chambers.